On the 11th of December, Cooperatives Europe, with President Jean-Louis Bancel, participated to the high-level launch of the first Sustainable Development Goals (SDGs) training certificate, hosted by Sciences Po university - School of Public Affairs - in Paris. 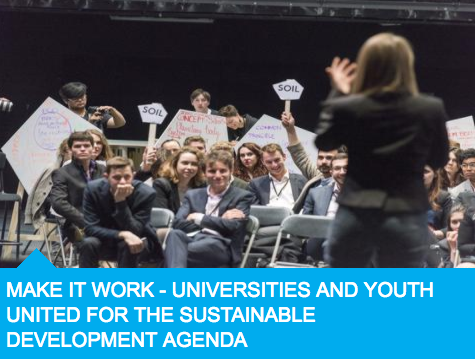 The event titled Make It Work in the framework of One Planet Summit, an initiative of President Macron, marked the launch of the first ever official programme on the SDGs, created by seven prestigious universities worldwide such as the Hertie School of governance in Berlin or Colombia SIPA in New York. Cooperatives Europe is pleased to actively contribute to the implementation of the programme that has been set up in partnership with governments, international organisations, the private sector as well as civil society. Cooperatives Europe works on the implementation of Agenda 2030 – the action programme behind the SDGs – in particular through the ICA-EU Partnership (#coops4dev), promoting cooperatives as key actors in driving sustainable development across the world. The expertise of Cooperatives Europe will be made available to the programme through our European and global networks, extending the cooperative added value within SDGs and their objectives beyond the international development frames. Cooperatives Europe welcomes the programme which will create the next generation of experts specialised in SDGs and looks forward to advancing education on building a better world through democratically owned and managed cooperative enterprises.